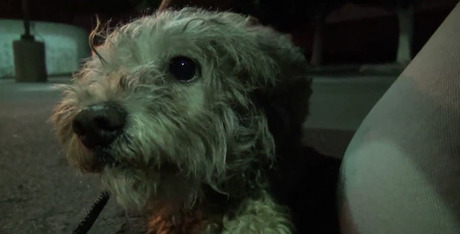 Hope for Paws got a call from a nurse, about a frightened dog that was living in the parking lot of a hospital where she worked. They knew they had to rescue this dog so they drove over. The dog had learned survival skills and become good at evading capture. They had to try again. Rescuer and friend to all dogs Eldad came back late that night. An expert on dog capturing, he knew his best shot was to sneak up on this one and collar her from behind. It worked, but she put up a struggle. Many canines living in the streets have been abused and tend to be untrusting of humans. This one was no different. She took off running with the collar on, so her rescuer ran with her and offered her calming words. She eventually ran out of steam. When she finally stopped, she seemed to realize that she was not in danger and Eldad was able to carry her to his car. Once the sweet little dog was secure the first order of business was a bath. After months of living on the streets, she needed it. She actually changed color from grey to white! 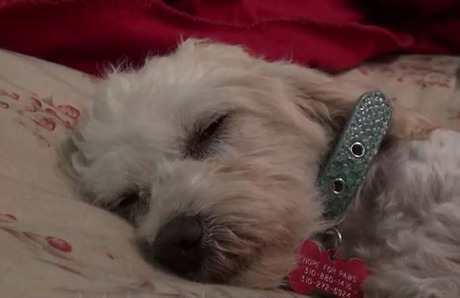 Oakley, a little poodle-maltese mix is living in foster care, learning to trust people. For more information contact Maltese Rescue of California. She is patiently waiting to meet her forever family.